Clump-forming perennial with basal triangular, shallowly lobed, toothed pale green leaves. Bears racemes of slightly scented small flowers with orange anthers in late spring. Height to 24 inches; spread 3 to 6 feet. 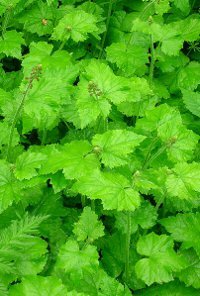 Grow as a groundcover in a woodland garden. For maximum freshness, please keep seed refrigerated in its original packaging until it is time to plant. Sow seed in containers in a cold frame in spring. Grow on in cool, moist humusy soil in part to deep shade.